1. Your new thing will be outdated in months when the next new thing comes out, and it will be faster, sexier and cheaper than your current thing. 2. There will always be rumors of the next new thing from Apple. The rumors begin months, sometimes years, before Apple announces an actual device. There were rumors of an Apple phone years before it came out. An Apple tablet device like the iPad is a similarly old rumor. With each announcement, speculation about the next version begins before the freshly removed cellophane on the current model has had time to float to the floor. Some prognosticators are better than others, because they have a better idea of what is most likely - usually not because of any real secret insight from within Apple. Apple is notorious for their tight security (the KGB and CIA could take lessons). So it was utterly unbelievable that not only had a new Apple device been spotted in the wild, but that a site as well known as Gizmodo had their hands all over it. It was amazing that Gizmodo was talking about it and had even torn the thing apart for the morbid amusement of many a fanboy. A flash for the camera on the back of the phone was an obvious inclusion (it's lack has been a major oversight in many opinions). A larger battery is a surprise to almost no one. And it'll probably last even longer than its increase in size would imply. A higher resolution display would also be an obvious addition. And might foretell HD video capture for the camera (putting the iPhone as a stronger competitor for devices like the Flip Cam). But the overall design was somewhat surprising. The iconic iPhone has evolved into a sleek, less curved, device with a metal band around the perimeter. Solid metal buttons for volume. The SIM card slot has been moved to the side, and now apparently uses the same micro-SIM used in the iPad 3G being released at the end of this month. Will the micro-SIMs be swappable between the iPad and the new iPhone? The iPad offers 250MB or unlimited data monthly plans with no contract from AT&T. I suspect it will be locked down somehow. The back of the device seems to be different as well. Speculation seems to point to an Apple patent for a ceramic case, which is transparent to electromagnetic waves used by WiFi and cellular devices. Probably the biggest surprise is a forward-facing camera in addition to the standard rear camera. The only obvious purpose for this will be for video chatting. but just as the accelerometer was applied to unforeseen applications, don't be surprised at the uses some developers may put the new camera (control apps with the wave of your hand). Apple requested, and received, the device back, which all but proves that it is a legitimate Apple produced device. But is it a final design? Many companies produce several different designs for new products. Is this the final configuration for the device? The iPad has a space for a forward facing camera, but one wasn't included in the released product. Will this delay the release of the new product? Doubtful as Apple likes to keep to their timetables. And more importantly, will the poor engineer who lost the phone in the first place ever be released from Apple purgatory? Will his career ever advance beyond mop-pusher? Will he be re-located to Apple’s secret research facility at the South Pole? What do you think, fellow Apple geeks? I think the iPad offers 250MB of data, not 250GB. Who is proofing this thing? Mea culpa. Too much work today converted Mb to MB, GB, and TB. Apple is notorious for their tight security (the KGB and CIA could take lessons). Do you really think the poor engineer "lost" the phone in the first place or was this a planned "loss" to build up the anticipation for the new release? Sure was great free advertisement! Chris, you tell it like it is as always. Very nice article and happy to see you in print! Through out the coverage I have not heard anyone in the press question the validity of this "leak". I am not suggesting that the product is not a valid Apple product. This entire thing could have been staged and no one is questioning this. I would not put it beyond anyone to suggest a "leak" like this as the begining of the hype for the new product. Has anyone asked or investigated if this is just the beginning of marketing swing for the launch? The timing is about right. The product failure on the new headphones for the shuffle could use a little distraction. And from the looks of what I read, the media is responding exactly as Apple would like them to respond. Hello. definate ploy! APPLE stock shot up $14. dollars in one day. NICE plan huh. One of the things that makes me think this wasn't intentional is that Apple doesn't need the publicity. One of the likely reasons they don't use events like CES to announce things is they don't need to go to the press. They can get the press to come to them. At most they may leak obvious features to fuel the rumor mill, but letting a prototype get manhandled outside of their control? I can't believe that. Steve Jobs and Apple are too controlling over product releases. This totally steals the thunder of the official announcement. At the iPad announcement select members of the press were allowed only limited access. And it was only days before the actual release that an even smaller group of select journalists (Mossburg, Pogue, Ihnatko, et. al.) were allowed to use the iPad on their own. Anything is possible. But I highly doubt this was intentional. apple stock went up $14 because it beat expected earning estimates by a long shot....not because of any ploy dealing with the "lost" or "intentionally left behind" next gen iphone. JMB – I sure hope it's not you proofing this because the article states 250MB! This was done on purpose. Apple is trying something different. Using viral marketing to push a product rather than the normal boring advertising that everyone else uses. Notice that the "take apart" movie did not show the Processor at all? You would think that if someone was going to disect a brand new iPhone thats one of the MAIN things they would focus on. It's because Apple did not want it shown. I think its great that they are trying something outside of the norm. But the reality is, out side of the norm is what Apple has done since Day 1. (Which really means this is normal for Apple – doing the unexpected.) Personally, I cant wait to upgrade my 3G iPhone to the next incarnation of what has been the best Cell Phone I have ever owned. Bravo to you Apple for once again making people "look twice." I know GP. Definitely not a ploy and not intentional. The Gizmodo take-apart (http://gizmodo.com/5520876/the-next-iphone-dissected) indicates that the processor, and most of the rest of the components are shielded, which makes sense if you've ever used a Blackberry and a speakerphone (bip-bip-bip-bip-bip). I'm sure they could have torn the shielding off, but it's not likely to be held on by screws. Replacing it would have been difficult. And would have compromised anything else they wanted to do with it. Now, once it's officially release I'm sure sites like iFixIt.com will have the thing torn to its base components within hours of getting their hands on it. And have the gory videos to go with it. It's most likely using the same A4 processor used in the iPad. I would think it unlikely that Apple would rush a newer processor out so soon after the A4, nor that they would continue to use the same or a slightly newer/faster ARM processor in the new iPhone since they have the A4 available. I think the 2 most important things to remember is that Steve Jobs is the one who shows off the products and it's highly unlikely that a young birthday boy was some genius apple strategist. He's a real guy with a real story and according to AppleInsider, he contacted the bar he left it in and frantically called repeatedly to see if it was returned. And if it was planned, then what does Steve do in June, just stand there and repeat what we know? Apple is a great company, but this proves it's certainly not perfect. Sure it would be nice to by cynical and think the loss of this device was a planned 'leak' but then you would have to link the person who found the phone to the people who first bit his offer of pics and then Gizmodo all in bed with Apple on it...I just don't see that. Worse is the fact that like all of us this poor Apple employee left his phone somewhere and it was immediately scooped up by someone looking for a score. In then end not bad for anyone but the poor employee. Duh, number one, you don't just "let employees take a new secret product out for a spin" maybe a bar. Number two, they don't just coincidentally fall into the the hands of the right people with cameras and press to show it off. Thank God I didn't find it. Me and Steve would still be saying "finders Keepers". Actually, lots of hardware develops let a small number of employees take products out into the real world for testing. This is especially important with devices that whose performance may vary based on location (thanks AT&T). I think its reasonable to assume that in Silicon Valley it's not surprising that the finder knew how special what he had found was, and contacted Gizmodo, one of the more popular gadget sites on the internet. This was a controlled leak. There is now way that a company like Apple will let an unannounced product to be taken out of the company without even having a pass-code. They did put a bunch of iPhone 2G in the field but after it was announced and even those were protected by a pass-code. So, the big question that I'm not seeing discussed is what radio did it have in it? Was it on AT&T or Verizon? Adam, that is a good question. It had been remote wiped, and the components were shielded. That would be one of the more significant findings. I'll wager that its still AT&T though. The "accident" was clearly done on purpose. I say this with proof. I did a bit extra research on the iPhone 4G by going to Gizmodo. 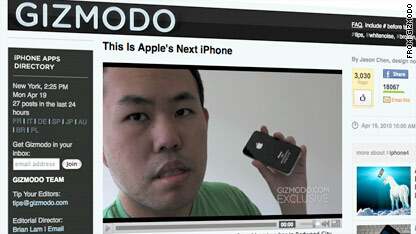 On Gizmodo there is a video of the iPhone 4G. This doesn't really tell anything, but further on the page, there is a picture of the iPhone 4G. In one of these pictures, it shows the bottom half of the back of the iPhone. (Where it usually says iPhone, __GB, Assembled in China, etc. On the photo where it is supposed to tell you how many gigabytes the iPhone is there are two X's. So it basically says, XXGB. If the iPhone weren't meant to be lost no one would have thought of putting it there, but since it is there, it can be proven that it was either because they had done it in case an "accident" occurred, or because it was planned to leave the iPhone behing. Option 2 seems more reasonable. There are several cases of prototypes that have made it to the wild long after the product has been released (and discontinued even) where the prototype has generic or missing information – like gov't certification numbers. Interestingly, if this was a hoax/intentional leak, Gizmodo is under investigation for breaking California crime. I don't think Apple's PR department would have allowed this to go that far. If it was planned, hope Gizmodo got paid enough to cover their pending legal expenses. Leak or lost, who cares. That thing is awesome and I'm getting one! 2. Apple would never advertise anything virally. They have a great advertising policy, as is. How do you think they were capable of selling millions of something like the 1st Gen iPhone (that lacked many standard features at the time) to the massess! 3. This is evidently the real thing! Imagine if you were in the place of the man who supposedly "Made" that smartphone. You would not have put as much care and attention as was depicted in the dissection images on Gizmodo. The small screws, the perfect placement of the Apple logo, the dense packing of all the chips together, the very "iPad-like" battery as well as a high-resolution screen all fitted nicely as though it were engineered at non other than Apple itself! 4. It says GB. Not MB. The iPhone was left behind because they are rubbing the iPad in peoples face. "Hey, you people with the iPhone! That phone isn't cool any more. Buy the iPad! It's shiny and it has different buttons. Come buy it even though it looks just like the iPhone." If you really want to have cooler stuff than your next door neighbor buy electronics from some Asian country because they're stuff is more up to date. The man who found the lost prototype iPhone 4G was Thomas L. Warner, 20, Redwood City, CA. Roommate of Brian Hogan, found the lost phone on a bar stool at a local bar in Redwood City, and handed it to Hogan. SEE PROFILE FOR PICTURE OF THE TWO. I definitely want to read more soon. BTW, pretty good design you have at this blog, but don’t you think design should be changed every few months?